Caroline searched for the perfect pair of comfortable yet stylish shoes for walking, working out, and travel. Here’s her review of Asics MetroLyte shoes. Mox flats can easily take the place of your travel flip-flops, while also providing an additional cute and casual shoe for dinners and other non-active events. I am glad I discovered the Native shoe. I love the fact I can wear them every day with most outfits and still feel stylish. Sorry, Toms. Both the Keens and the Ahnus provide great support for long days of walking. Both are also well-ventilated. But which ones won the travel sandal comparison? When packing for my three month trip to Australia and Asia, my Crocs were one thing I knew I would pack. Let me give you a couple reasons why they are fantastic. Tieks Fold-up Ballet Flats: An Answer for Female Backpackers? An ode to Tieks. 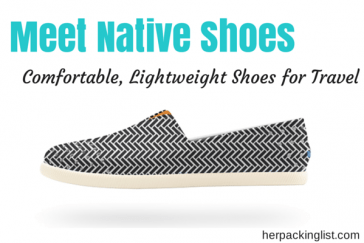 While Tieks ballet flats are definitely great for travel, we delve further into this topic and whether they’re suitable for backpackers in particular. Day 8 talks about that extremely difficult packing task: how to choose your travel shoes. It’s not easy, but with a bit of planning, it can be less overwhelming. Women’s sandals seem to fall into two categories: comfortable, practical and ugly or stylish with paper-thin soles. I’ve taken both travelling and have never been happy… until now. Those fancy hiking/walking sandals can quite possibly be the best pair of travel shoes you buy. Kristin Repsher shares her love for the Teva Tirras in this review post.